"The Everglades Resort At Hatzic Lake - Gated lake community open year round approx. 1 hour from Vancouver. (no year round living). Waterfront UA on a channel with it's own dock, canoe and paddle boat. 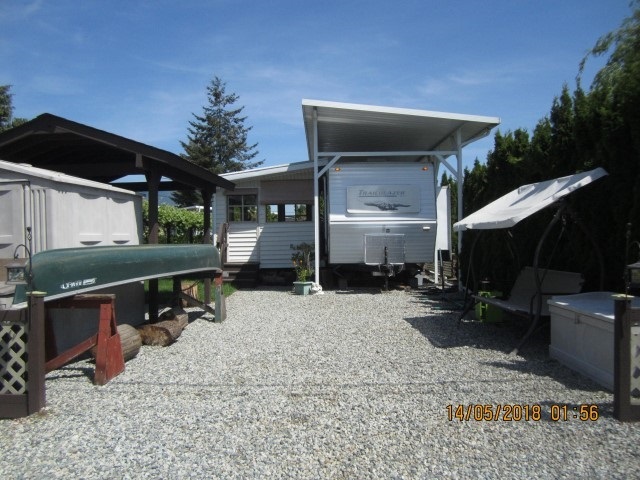 This lovely 2006 trailer with huge slide out and aluminum cover that sleeps 8 people and has an extra bonus room built on for year round entertaining. Set up for year round use. Very nicely done up, private, fenced, practical and a huge 30x75 lot. Storage shed, New outside covered area, new paint outside. Too much to list. It doesn't get any better than this for the price. Call for more information. Just pack your bags and you are good to go. Own your very own get away on the lake!"